Apply oneself to the study of the differences in the types of conflict found within a complete narrative. With the Dramatica theory of story you do more than simply fit your Hero into a prearranged journey of sequences. In sharp contrast, you assume the role of Author and determine the source of conflict in your narrative’s individual storylines. While the end result is greater effectiveness in communicating your story’s unique thematic message, it can be difficult figuring out exactly where your conflict falls. 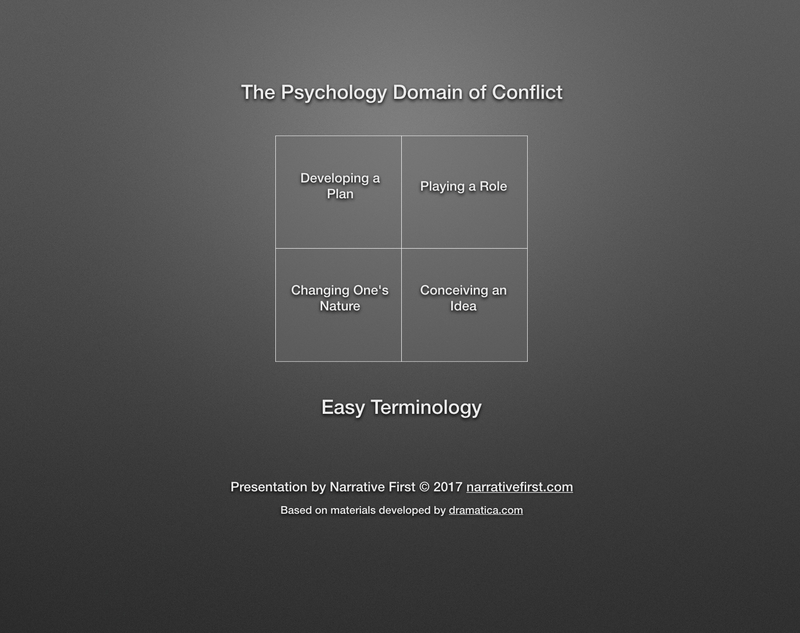 One of these areas of conflict centers on psychological manipulations. 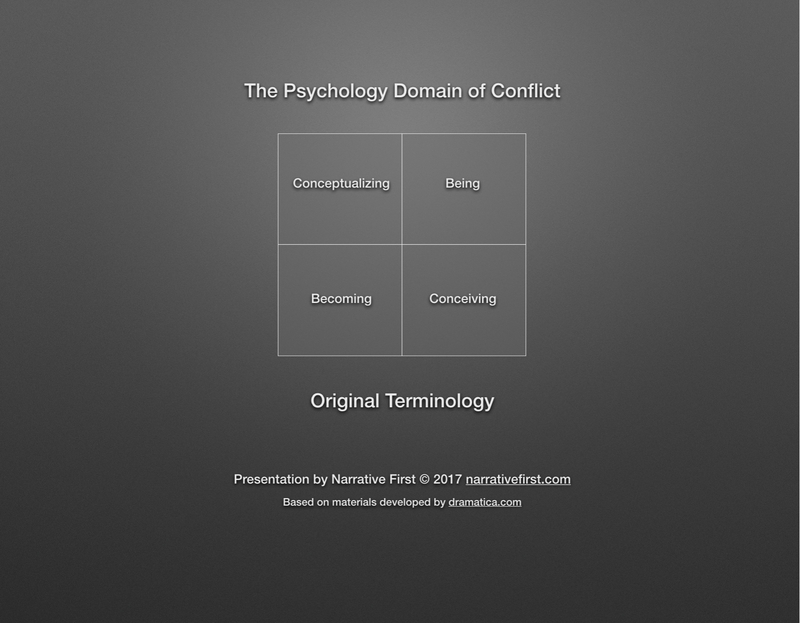 Instead of looking at violent attacks or treasure hunts or living under English rule, stories that center on Psychology focus on conflict arising from how people think. When it comes to the difference between Changing One’s Nature and Playing a Role it helps to think of the original terminology that shipped with Dramatica back in 1994. In fact, when working with writers or producers I always suggest that in the beginning you should frequently switch back and forth between the two different versions. The “easy” terminology—the default setting for the most recent version of the software—was a marketing decision made a little over a decade to make Dramatica more palatable for writers new to the theory. The idea was that if they could somehow make the concepts friendlier and easier to understand, they could overcome some of the bad reviews surrounding the complexity of the theory. The problem with that line of thinking is that it takes what is a broad and all-encompassing swath of narrative and narrows it down to a singular instance. It’s like the Hero’s Journey vision of story where Protagonist and Main Character always find themselves trapped within the same “Hero”. Yes, it works for a particular subset of stories, but not for every story. Spanish does a much better job of defining the differences between these two. Both Ser and Estar mean “to be”, but in different ways. Ser pertains to identity and is thought of as something fundamental…Estar differs by establishing states of being, condition, or location, and is referred to as the Present Progressive. With Being characters come into conflict by thinking they will behave or be a certain way for awhile to try and impress or manipulate someone. Consider the Supers in The Incredibles: characters pretending to be something they are not, in order to fit in with society. Conflict surrounding the changing of one’s nature exists in films like Moulin Rouge! where each and every character strives to transform their essential nature and the nature of the Moulin Rouge itself. They believe that if all goes according to plan, the Moulin could become a serious destination for respectable theater. Developing a Plan was originally labeled Conceptualizing, a FAR more interesting and compelling story point than simply describing some plan of action. Conceptualizing includes envisioning, imagining, and conceptually fitting components and people together. It can even be about figuring out how to make a relationship work. Ang Lee’s Eat, Drink, Man, Woman is a perfect example of a characters trying to conceptualize a new vision for their family; eons away from simply “Developing a Plan”. Conceiving an Idea is much closer to the original term Conceiving, but can include all manners of inventing and originating beyond simply coming up with an idea. The idea that “Anyone Can Cook” features front and center in Pixar’s Ratatouille and fits easily into the concept of Conceiving an Idea. 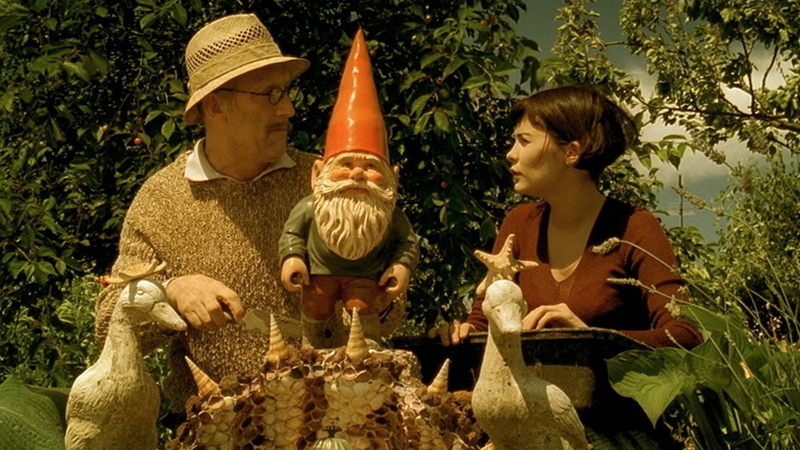 But a film like Amelie focuses more on the conflict surrounding characters working to reinvent themselves. Both work to show Conceiving, but only the former easily slides into Conceiving an Idea. Sometimes the strive to improve and reach more heads results in lowering oneself to the lowest common denominator. Dramatica is difficult to learn, and even harder to communicate and teach. But focusing on making it easier only limits the power and scope of its concepts. Writing a story, especially one that holds together from beginning to end, is hard enough even without imposing a limited view of conflict. Switching back and forth between the easy and original terminology in Dramatica ensures that one avoids sacrificing accuracy for ease of use. Shoulder the difficulty and ignore the negative reviews, your Audience will appreciate and embrace your efforts to give them something meaningful and important.